Use our plastic crates instead of cartons for your removal. They come with easy peel labels so you know what is inside. A tamper proof seal ensures the lid doesn't open until you want it too. They are light weight and stack easily. Click on the circles and navigate through the property . We are a professional removals company and cover the Greater London and Surrey area. At Queens Removals, we don't just promise you superior service and we don't just promise you absolute satisfaction. We promise you exceptional value. Our fees are the best in Surrey and whilst we may cut the costs, we never compromise quality. So when you choose us, you are guaranteed the most competitive rates and discount packages. We also offer special deals for repeat customers. That's real value - That's a Queens Removals promise. If you're moving house, our team of professionals can take care of every aspect of your removal with a range of services to suit your budget. From internal office moves to international company relocation, we offer flexible commercial packages to suit individual requirements. We offer state-of-the-art storage facilities in Weybridge, Surrey for both residential and commercial clients. Many movers like to do their own packing, but just be aware that furniture removal in Surrey is no easy task – and the packing should begin before moving day. Alternatively, leave it to our master packers and we’ll have the packing job done in no time, on the very morning that the full relocation takes place. We maintain professional standards even as we move heavy furniture through bad weather, narrow stairs, broken elevators and a lot more, so save your anxiety and give all the hard work to us. Our teams of furniture removalists in Surrey are prepared to deal with anything – including the job of unpacking everything after the move has been completed. If your new location isn’t quite ready to receive all your furniture, or there are other items which need to be put in storage, fear not – we’ve got you covered. Surrey's premier furniture removalists are also willing and able to lock your belongings safely away in temporary storage for as long as you need. Our storage warehouse is ideally suited to provide a secure home for your belongings. 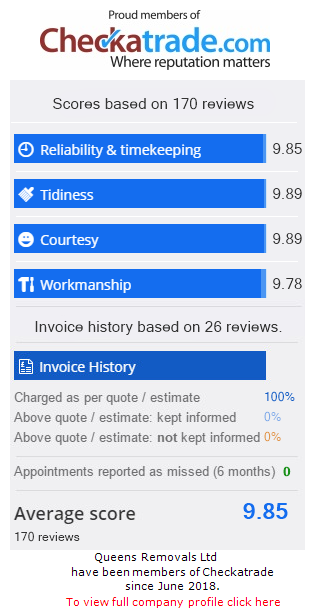 With all of these features and our unfailingly friendly service, it’s no wonder we at Queens are Surrey’s most complete and professional removal team for homes and offices. Browse our website for special package deals and promotions, and contact us anytime to learn how we can help you – or even just to speak with us about the prospect of relocating in the greater Surrey area, with no further obligation. From start to finish, it’s our job to make your move go as easy and as hassle-free as possible. Beginning with that initial phone call and quotation, and ending with a smile and a firm shake of the hand with your furniture and other possessions safe and unpacked at your new location, Queens Removals has the resources, know-how and work ethic needed to turn the most logistically challenging tasks into a breeze. Come talk to us, and let us show you what we can do. Moving between locations is a complicated task, even before worrying about how many boxes you need or how to carry those big sofas, mattresses and desks down the stairs. Utilities must be set up, paperwork must be signed, mail must be redirected, friends and relatives must be contacted, along with dozens of other last-minute requirements. We might not be able to manage everything, but we at Queens Removals in Walton-on-Thames can take complete care of the most labour-intensive part of your move, leaving you free to begin life at your new location with a spring in your step and a smile on your face.